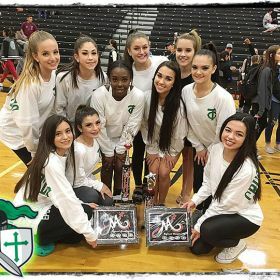 Once again the Tampa Catholic Crusaderette Dance Team walked away with top honors in their category at the MA DANCE Southeastern United States Regional Competition held in Sanford, FL on March 10. 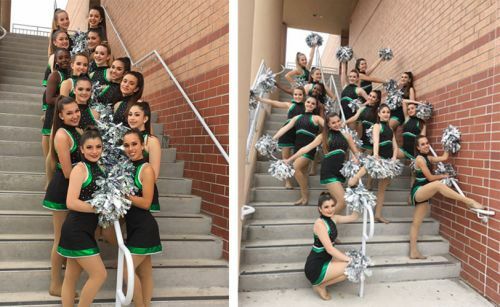 The team competed in four categories including Jazz, Kick, Hip Hop, and Pom. They received a Super Sweepstakes trophy which is earned by receiving scores of 90 and above from all three judges for the top-scoring three routines. The lowest scoring performance is kicked out and awards based on the remaining three performances. However, for the first time ALL four routines received 90 and above from all the judges! The Crusaderettes also received awards for Best In Class, Choreography, Technique and High Point in all routines. The Officer's Routine (Alexis Fernandez '18, Danielle Wiles '18, and Kennedy Green '20 (filling in for Riley Lazzara '18) were awarded a Superior Trophy for 3rd place and also an award for technique. They competed against 15 other Officer Routine performances. Not to outdone, Sofia DelRosal '21, competed in Junior Dance Solo and was awarded a Superior medal. Congratulations to the Crusaderettes! Tampa Catholic is very proud of you!